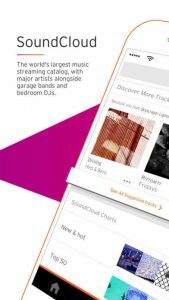 SoundCloud is the world’s largest music and audio streaming platform – 150 million tracks and growing. With a buzzing community of artists and musicians constantly uploading new music, Sound Cloud is where you can find the next big artists alongside chart-topping albums, live sets, and mixes for every occasion. Our enormous catalog lets you discover amazing hip hop, electronic, rock, classical, jazz, podcasts, audiobooks, sports and much, much more. Sound Cloud offers a family of products for all listeners and creators. Join our diverse community, connect with artists you love, and start discovering new music today. The more you tell us, the better Sound Cloud gets. SoundCloud is available in English, Brazilian Portuguese, Dutch, French, German, Italian and Spanish. *Get Sound Cloud Go free for first 7 days, and $5.99/month after that. Free 7-day trial only available for users who haven’t previously subscribed to Sound Cloud Go. Subscription automatically renews unless auto-renew is turned off at least 24-hours before the end of the current period. Account will be charged for $5.99 within 24-hours prior to the end of the current period. Subscriptions may be managed by the user and auto-renewal may be turned off by going to the user’s Account Settings after purchase. Any unused portion of a free trial period, if offered, will be forfeited when the user purchases a subscription. Offer limited to users based in the US. **Get Sound Cloud Go+ free for first 30 days, and $12.99/month after that. Free 30-day trial only available for users who haven’t previously subscribed to Sound Cloud Go+. Subscription automatically renews unless auto-renew is turned off at least 24-hours before the end of the current period. Account will be charged for $12.99 within 24-hours prior to the end of the current period. Subscriptions may be managed by the user and auto-renewal may be turned off by going to the user’s Account Settings after purchase. Any unused portion of a free trial period, if offered, will be forfeited when the user purchases a subscription. Offer limited to users based in the US.